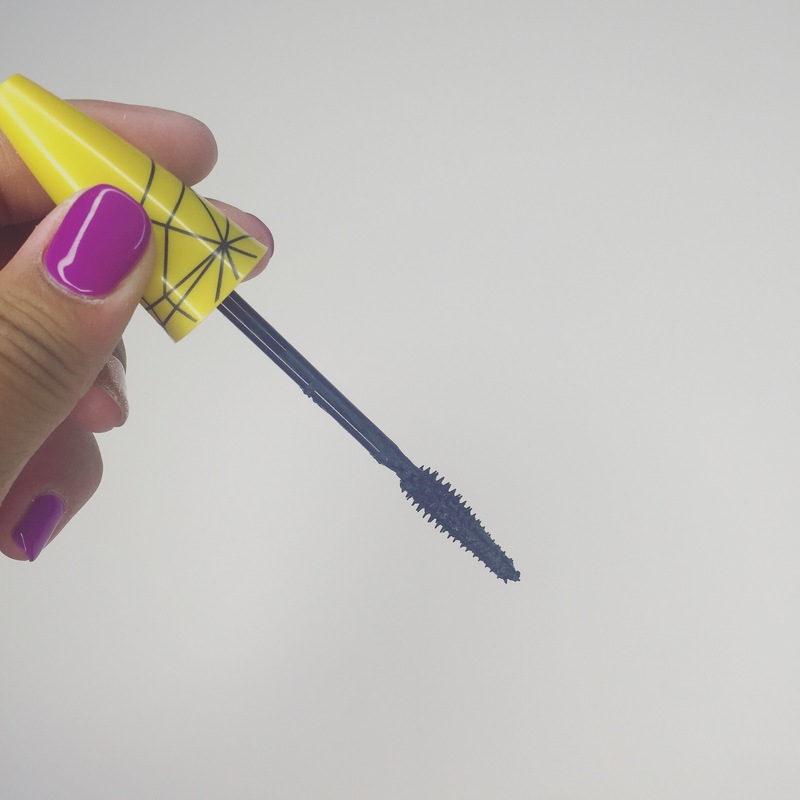 The Colossal Spider Effect, Volume Express, Waterproof mascara. Whew! Isn’t that a mouth full? Today I wanted to give my thoughts on this new product and let you know if it does what it claims. When I seen the commercial, I thought that it looked amazing! It gave the model very long, spidery lashes. It claims to have a certain type of bristles that will group your lashes together to create the spider effect. Being the makeup junkie that I am, I purchased it. I also really needed a new mascara, I was pushing the last one to the LIMIT, so perfect timing. Now, without further ado, here are some pictures and thoughts on The Colossal Spider Effect. This is how the product came, your standard Maybelline packaging. It was around $7.00, pretty decent price for a drug store mascara. I picked up the color Classic Black and I always make sure to get waterproof. I love the outside of the bottle, the yellow is eye catching and the black spider web on the wand handle is straight to the point. 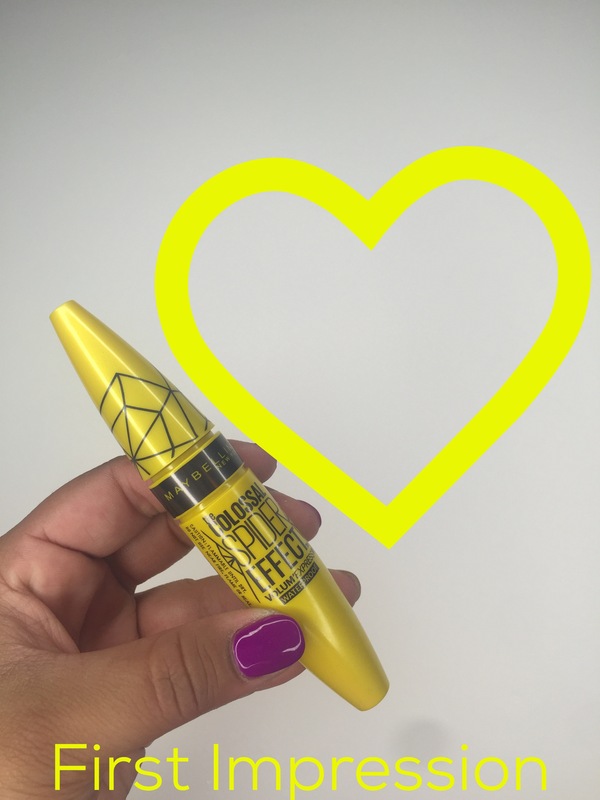 When I first opened the mascara, I could see the little cup bristles that was described. It has the cone shaped handle, so very easy to grip. The actual wand is wide on one side, it is bigger at the top and gets smaller as it gets closer to the bottom. When you turn it wand side ways, the wand gets thinner. 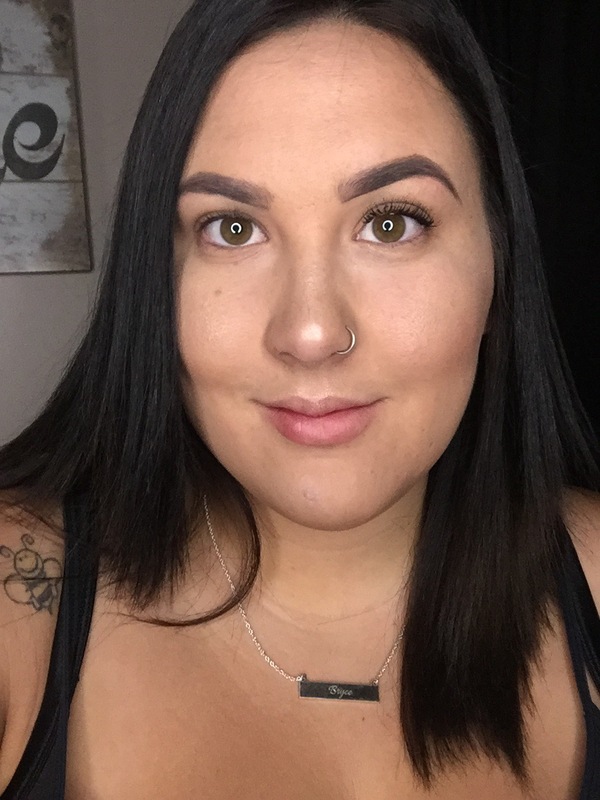 When I first applied the product, you would have thought that today was the first day that I ever wore makeup. Super messy and just got all over the place! I know that when mascaras are new, most of them are runny, but this was more runny than any mascara I have ever used. When I am in a rush, I don’t have time to clean a ton of mascara off of my face. I want to apply and go. Yes, there will always those days when you need everything to go right and it does just the opposite. I get that, but come on now, not right off the bat! With that being said, I don’t feel as if it gave me a spider effect at all! I don’t know if I may be applying it wrong or what, but the whole thing was a disaster. However, I will give it another chance, maybe I need to apply it a few more times to get the gist of it. I refuse to throw products out that have sucky first impressions. So maybe after a few more applications, I will like the product even more, you never know. I can’t tell you how many times I have HATED a product the first time I tested it, just for it to turned out to be the best product in the world. Never give up on something, no matter what it is, just after the first try. Life can sometimes surprise you. As for length, it gave me a little, but not like I was hoping. I will say that it did give me plenty of volume, I can always use some of that for my baby lashes (the struggle is real). Here is the application compared to my natural lashes, a difference, but not by much. So, for my final rating of this product I would give it a 2/5. It was messy, but it did give me better volume and I liked that. It did say on great throughout the day, I haven’t noticed any transfer. Let me know if any of you have tried this mascara, maybe I am doing something wrong. I need to know your secret!! I hope that you enjoyed this first impression, I really liked making it and plan on creating some more. I am also planning a Fourth of July makeup look. If you have any request, be sure to leave them in the comment section. I would like to thank all of you for reading this post, it means the world to me to know that people actual care about what I have to say. I love you all and greatly appreciate you. Once I hit 300 followers, I plan on doing a giveaway, so make sure that you are following me! That’s what I thought, but thought it looked cool lol. I am glad that I could help! Thank you for this review! 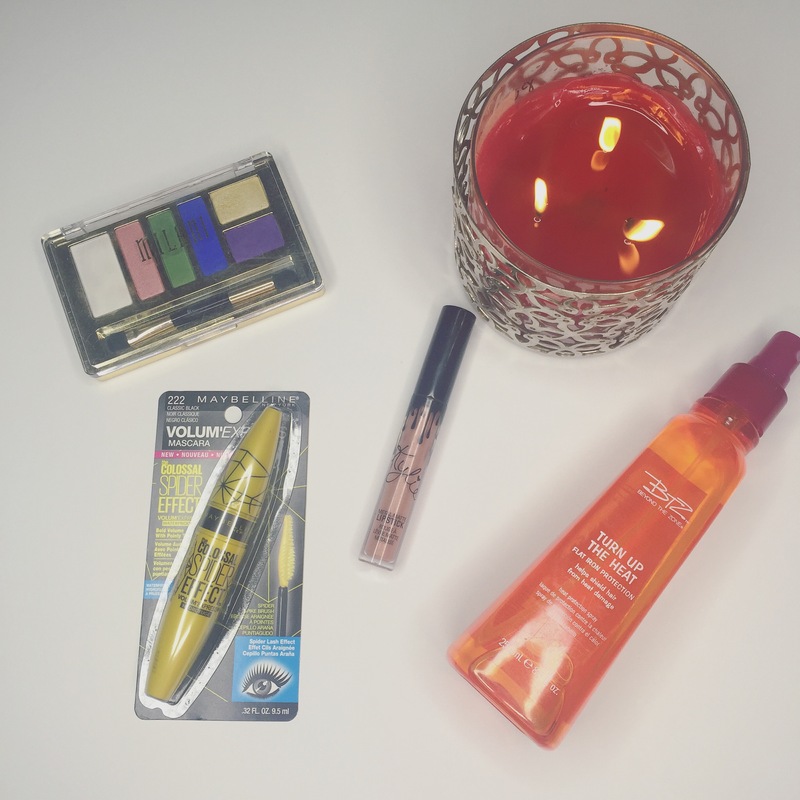 I find that mascara formulas change along the way and I do hope you will give an update when the formula becomes a bit more dry. some improve and some dont. Yes I will for sure update!! Thank you for reading my post!